From running the gridlock gauntlet to braking for bike couriers, the challenges of manoeuvring through the urban jungle requires a certain skill set behind the wheel. And these drivers don’t have it. At all! Back for a bumper-crushing eighth season, specialty television’s #1 series Canada’s Worst Driver returns to Discovery Channel on Monday, October 29 at 10 p.m. ET/PT. Oh Canada, buckle up! CANADA’S WORST DRIVER is back. Returning for a gear-grinding, bumper-busting seventh season, the #1 series on specialty television returns to Discovery Channel, Monday, October 24 at 10 p.m. ET/PT. The new season is all-Canadian, in style and in substance – from the maple leaves, red-and-white, and plaid flannel; to the “icy corner” and “snow plough” driving challenges. With a weekly reach of more than 3.8 million viewers last Fall*, the smash hit series returns with writer and host Andrew Younghusband and features new drivers, new challenges and countless cringe-inducing and water cooler-worthy moments. The experience continues online with exclusive content at Worstdriver.ca and interactive LIVE chats every Monday night @DiscoveryCanada (#CWD). It’s going to be a bumpy ride, eh? Since its debut in 2005, more than 50 drivers have undergone CANADA’S WORST DRIVER’s unique brand of intensive rehabilitation. And yet, there is no shortage of delinquent drivers still terrorizing Canadian roadways! Hitting the highways in search of this year’s biggest offenders behind the wheel, CANADA’S WORST DRIVER 7 put the brakes on eight dreadful drivers – hailing from British Columbia, Alberta, Saskatchewan, Ontario, Quebec and Nova Scotia – and sent them to driver rehab to make Canada’s roads just a little safer. CANADA’S WORST DRIVER 7 follows these eight drivers – each nominated by a friend or family member – as they are put through their paces in a controlled driving environment and evaluated by a panel of driving experts. Each episode features tried-and-tested challenges with a Canadian-themed twist, plus speed performance fundamentals designed to push the drivers to their limits and teach them crucial safe driving skills. Each driver must master basic training and more advanced techniques for dealing with Canada’s trickiest driving situations before graduating from rehab. Can their bad behind-the-wheel behaviours be curbed with expert coaching and a little cajoling? Hauled off Canada’s highways, these eight disastrous drivers head to the Driver Rehabilitation Centre. There, they meet the team of experts, including: Cam Woolley, traffic expert and former OPP sergeant, returning for a seventh season; Philippe Létourneau, a professional high-performance driving instructor, back for a fourth season; and Peter Mellor, an instructor with the Advanced Motoring Bureau (AMB) who joins the panel for a third season. And new to Season 7, relationship therapist Shyamala Kiru brings a new perspective and context to the panel, revealing how these unsafe driving practices are threatening these drivers’ personal relationships. These experts have their work cut out for them as they put the drivers through their paces. Each week, one driver will earn the right to merge back onto Canada’s roadways, until there is only one unlucky driver left at the side of the road, owning the dubious title of Canada’s Worst Driver. · Ben, from Surrey, BC, was nominated by his wife, Jan. Ben’s lack of understanding behind the wheel is driving a wedge between them – they no longer enjoy being in the car together. Ben also drives a stick shift… but he really shouldn’t. · Tab, from Calgary, AB, is extremely nervous and highly emotional behind the wheel. Her boyfriend, Matt, hopes that expert coaching will help her gain confidence and conquer her fears behind the wheel. · Aaron, from Calgary, AB, bought to rehab by his father, Lee. In 2005, Aaron was blindsided by a reckless driver in a near-fatal accident that put Aaron in a coma for two months. When he woke up, Aaron could not remember his own father. Or how to walk. Or drive. While he never lost his license, Aaron needs to regain skills and confidence. · Sly, from Lethbridge, AB, is a deliveryman who has difficulty with directions and relies on his phone’s GPS system to get the job done. He has been brought to rehab by his brother-in-law, Fred, over concerns that Sly is addicted to his technological driving devices. · Lauri, from Prince Albert, SK, is an animal lover and goes everywhere with her two dogs, cat and bird in the car. Her fiancé Shaun wants Lauri to realize the dangers of this habit and understand that she needs to change her ways. · Jon, from Bowmanville, ON, just might be Canada’s most dangerous driver. With one of the cockiest attitudes ever seen on the series, Jon is in desperate need of rehab. A dangerous speeder, he is addicted to the rush and adrenaline – his girlfriend Elise wants him to curb his behaviours before considering a future and family together. · Afiya, from Montreal, QC, is content to hog the road, run red lights and make pedestrians scatter. Her friend Cindy insists she needs help, but Afiya heads rehab to prove her friends and family wrong. · Shirley, from Port Caledonia, NS, is only comfortable driving in the small towns of Cape Breton. Recently retired, she wants to start visiting her daughter, Janis, in Halifax. But merging, road signs and reversing are confusing and frightening to Shirley. Engine revved and looking for more? Head to Worstdriver.ca for exclusive behind-the-scenes video, bonus content and an all-new Safe Driving Quiz. Got something to say? Chat live @DiscoveryCanada during the broadcasts (#CWD), and check out the perennially popular Exhaust Pipe forum. The website will also feature exclusive interviews with Younghusband, the participants and production team; plus bios, photo galleries, episode recaps and full episodes (available a week after broadcast). CANADA’S WORST DRIVER 7 is produced for Discovery Channel by Proper Television. Who is Canada's Worst Driver? Only three remain. This week, CANADA’S WORST DRIVER 6 handed Jamie her keys and said goodbye as she joined the ranks of the season’s other participants who’ve returned to the driver’s seat with improved skills behind the wheel. So who is CANADA’S WORST DRIVER? Find out Monday, December 13 at 10 p.m. ET/PT when Lance (Ottawa, ON), Dale (St. Catharines, ON) and Brad (Calgary, AB) compete for the unlucky title. Screeching to a halt with a stunning season finale on Monday night, one of these drivers – the least improved after intensive Driver Rehab – will be named Canada’s Worst Driver. In a shocking season that started with the much-talked-about decimation of a mint-condition Camaro and has the most hotly-debated drivers heading to the finale, the 6th year of CANADA’S WORST DRIVER continues its winning streak for Discovery Channel. The first three seasons of the perennial favourite ranked consistently in the Top 5 programs on Discovery Channel, with Season 4 claiming the #1 rank on Discovery Channel for the first time. Then last year, Season 5 accelerated past all channel records to become the #1-ranked Canadian series on specialty television**, with the Finale episode drawing more than one million viewers. And what makes CANADA’S WORST DRIVER 6 a “Monday night must-see” on Canadian television, making Discovery Channel the #1 specialty network in its 10-11 p.m. timeslot, and regularly attracting audiences bigger than some conventional channels (including CBC and City)*? Compelling – and at times, cringe-inducing – CANADA’S WORST DRIVER features dangerous drivers on the road to rehabilitation. With host and series writer Andrew Younghusband as our guide, eight disastrous drivers – each nominated by a friend, family member or colleague during a national search – were put through their paces in a controlled driving environment and evaluated by a panel of driving experts. Did professional coaching and a little cajoling help to curb their bad behind-the-wheel behaviours? · Lance, from Ottawa, ON, has only been driving since February 2010, after getting busted for driving uninsured and without a licence at age 16. Lance saved, bought a car and is ready to enjoy the freedom of the open road – except that he’s so nervous and suffers near-panic attacks on Ottawa city streets. He also drives a standard car… but really shouldn’t. · Dale, from St. Catharines, ON, is clueless about the rules of the road. This charming granny wants to learn and improve, but no one is brave enough to get in the car with her. She’s spent $50,000 on replacing and fixing cars she’s damaged. She even hit a police car while he was writing her a ticket. · Brad, from Calgary, AB, has racked up so many accidents and tickets that his wife and father-in-law have banned him from driving. But a change in family circumstances is forcing Brad back on the road – whether we’re ready for him or not. Didn’t buckle up for the premiere and feel like you’ve missed the ride? With the outrageous finale just days away, it’s not too late to merge into the fast lane and catch up as Discovery Channel presents a CANADA’S WORST DRIVER 6 Marathon on Sunday, December 12, from 3 p.m. to 10 p.m. ET (12 p.m. to 7 p.m. PT). Over the course of the seven-episode marathon, see how these eight disastrous drivers fared on the road to rehabilitation, from the first key in the ignition to the final slamming of the brakes. Then fasten your seatbelt for Monday’s finale – it’s going to be a bumpy ride! Featuring exclusive bonus content, full episodes – and the ever-popular Exhaust Pipe forum where viewers can share there comments about the show – fans of CANADA’S WORST DRIVER 6 have made Worstdriver.ca the most-visited page on DiscoveryChannel.ca this season (Oct. 22-Dec. 9). The ultimate online destination for fans of CANADA’S WORST DRIVER 6, Worstdriver.ca tallied 615,000 video views and 131,000 page views, making the series the #1 video and #1 show page on DiscoveryChannel.ca this fall. Last Fall – gripped by grinding gears, shocked by speeders, and offended by fender-benders – viewers nationwide left their cars in the driveway, stayed home and tuned in to CANADA’S WORST DRIVER. And now it’s back… The #1-ranked Canadian series on specialty television*, CANADA’S WORST DRIVER, returns to Discovery Channel on Monday, October 25 at 10 p.m. ET/PT. Buckle up! Season 6 promises to be the bumpiest ride yet! With a weekly reach of over four million viewers last Fall** – and a landmark Season 5 finale drawing an audience in excess of one million viewers*** – the smash hit series returns with host Andrew Younghusband and features new drivers, new challenges and countless cringe-inducing and water cooler-worthy moments, plus exclusive online content at Worstdriver.ca. CANADA’S WORST DRIVER 6 follows eight disastrous drivers from across the country – each nominated by a friend, family member or colleague – as they are put through their paces in a controlled driving environment and evaluated by a panel of driving experts. Can their bad behind-the-wheel behaviours be curbed at Driver Rehab with expert coaching and a little cajoling? Week by week, one driver will earn the right to merge back onto Canada’s roadways, until there is only one unlucky driver left at the side of the road, owning the dubious title of Canada’s Worst Driver. Since its debut in 2005, almost 50 drivers have undergone CANADA’S WORST DRIVER’s unique brand of intensive rehab. And yet, there is no shortage of delinquent drivers still terrorizing Canadian roadways! Host Younghusband is back with arguably the worst batch of drivers we’ve ever seen. Each episode through the eight-part series features some tried-and-tested challenges – and unique to Season 6, some “lessons from the racetrack” in speed performance fundamentals – to push the drivers to their limits and teach them crucial safe driving skills. To the secure the safety of unwitting drivers and pedestrians everywhere, CANADA’S WORST DRIVER 6 assembled a panel of driving experts who put these driving menaces through tests designed to improve their motor skills. After first confiscating their licenses, the experts corral these driving menaces and enrol them in a “crash course” at the Driver Rehabilitation Centre. Once there, the participants meet the team of experts, including: Cam Woolley, traffic expert and former OPP sergeant, returning for a sixth season; Philippe Létourneau, a professional high-performance driving instructor, back for a third season; and Peter Mellor, an instructor with the Advanced Motoring Bureau (AMB) who joins the panel for a second season. And new to Season 6, psychotherapist Dr. Lauren Kennedy-Smith will examine some of the issues behind the drivers’ horrible habits. · Paul, from Collingwood, ON, is a former stunt motorcyclist who has logged countless kilometres on his bike… but next-to-none on four wheels. But after relocating to Collingwood, Paul needs the skills and training to tackle winter driving conditions – and keep his temper in check. · Jamie, from Hampton, NB, is paralyzed by fear behind the wheel after hitting an elderly couple. And the stairs to her house. And her husband’s truck – twice. She failed her driving exam four times and is an emotional wreck on the road. · Lawrence, from Ottawa, ON, has only been driving since February 2010, after getting busted for driving uninsured and without a licence at age 16. Lawrence saved, bought a car and is ready to enjoy the freedom of the open road – except that he’s so nervous and suffers near-panic attacks on Ottawa city streets. He also drives a standard car… but really shouldn’t. · Dean, from St. Laurent, QC, is originally from Zimbabwe and he’s having difficulty adjusting to Canadian driving rules. Even basic ones, like which side of the road to drive on, obeying stop signs (optional?) and speeding. · Diane, from Edmonton, AB, cannot park between two cars, cannot drive at night, cannot drive in the rain… or in fact drive beyond her five-kilometre comfort zone. But trapped in the suburbs, this lovable mom needs to overcome her limitations behind the wheel. · Scott, from Chestermere, AB, is addicted to the rush and adrenaline of weaving in and out of traffic at extreme speeds. With the heaviest lead foot that this series has ever seen, Scott just might be Canada’s most dangerous driver. Eight of the country’s most appalling drivers and their nominators begin their remedial treatment process by first driving to The Rehab Centre, situated at an undisclosed Ontario training location. A Basic Assessment Challenge reveals a dreadful lack of even the most fundamental driving abilities in all of the candidates. The experts consider this bunch to be the worst group of drivers ever sentenced to CWD Rehab – the collision course is set and it’s anybody’s guess as to who will ultimately be branded Canada’s Worst Driver. Canada's Worst Driver is Casting for Season 5! 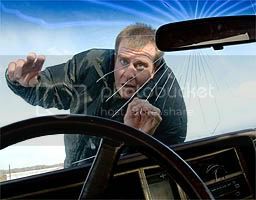 Attention bad drivers, Canada’s Worst Driver, which airs on the Discovery Channel, is getting set to find the worst driver in Canada all over again in 2009. Safe drivers, be prepared to get off the road as Season 5 of the show gets ready to accept submissions. The Discovery Channel series Canada’s Worst Driver is looking for drivers for the upcoming fifth season. Submissions from the Barrie area will be reviewed immediately and producers will visit the city in early April to meet with the worst of the worst. The show aims to resolve serious and dangerous behaviors by putting driver through a series of challenges based on core driving skills. Drivers graduate each week until one is crowned Canada’s Worst Driver. Canada’s Worst Driver is officially accepting nominations for season 5 of the hit show! To give the bad driver in your life an opportunity to learn from the country’s best at a state-of-the-art driver’s rehabilitation centre, email driver@propertelevision.com or call 1-866-598-2591. Each and every nomination is considered. For those who aren’t familiar with the Discovery Channel’s Canada’s Worst Driver, it’s a show based upon Britain’s Worst Driver. The Canadian show is filmed at The Driver Rehabilitation Center, an abandoned airforce based near Picton, Ontario. The nominees for Canada’s Worst Driver have their car keys or driver’s licenses confiscated while they undergo weekly driving challenges with the person who nominated them along for the ride in the passenger seat. Every week, the best driver of the week graduates the safe driving program, while the other contestants on the reality show fight to renounce the title of Canada’s Worst Driver. The fantastic audiences for the television premiere come on the heels of more than 50,000 sneak peek video streams on discoverychannel.ca. Viewers that missed last night’s landmark episode can catch it again on Saturday, November 1 at 9 p.m. ET/PT on Discovery Channel. Alternately, the full premiere episode will be available online at www.discoverychannel.ca following CWD4’s second episode on Monday, November 3. CANADA’S WORST DRIVER stars host Andrew Younghusband along with Cam Woolley, Traffic and Safety Specialist with CP24, formerly Sergeant with the OPP Ontario Highway Safety Division. Other experts include Philippe Létourneau, professional high performance driving instructor, and Dr. Louisa Gembora, psychologist and race car driver. New to the panel this season is head driving expert Dan Bagyan, an instructor with the Signature Driving School.